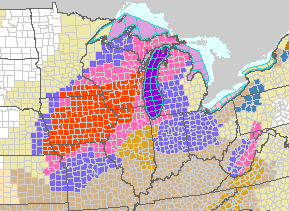 Blizzard warnings continue (orange) from St. Joseph, MO to Green Bay including virtually the entire State of Iowa. The official snow depth at the Des Moines Airport is 11.7" and at the NWS office in Polk City, 13.1 inches. There is major drifting of the snow. O'Hare already has two hour days. Chicago has a winter storm warning (pink). Flights have been cancelled from here in Wichita, at Omaha, Des Moines and other airports. Here is my Airline Crisis Survival Guide. The map below depicts the snowfall up to midnight. 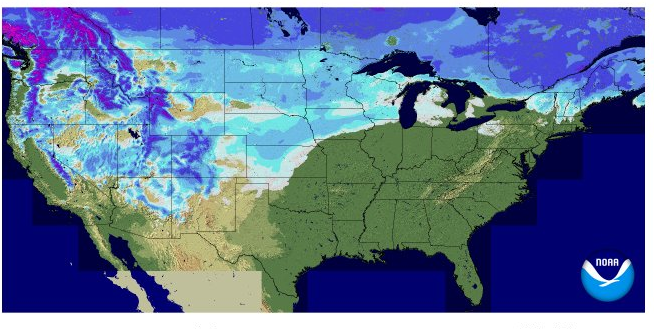 That dot in south central Nebraska is ten inches. Love your blog updates. I know we are still in the midst of the current winter storm ... But what are your thoughts on the storm for Christmas Day? I hope to have a posting on that topic this evening. I have been so busy today, I haven't had time to look at next week but I will make it a point by 6pm or earlier. No worries! :-) I always know that if you write about it ... it's an important event. Take care.